Last month I was really inspired by Alys’ ScrapHappy greetings cards, so this month I decided to have a go myself. I have loads of card blanks and piles of scrap paper and fabric. I’d also got a 2018 calendar that I couldn’t bring myself to throw out, some old greetings cards and some bits and pieces left over from the days when I used to make a hundred or so Christmas cards to send every year. I started simple with some glue, paper scraps and the old calendar. The first one I made was a bit messy and I applied my glue unevenly, so it came out a bit wrinkled. Never mind, it’s a learning process and I was very pleased with my final attempt on the yellow card. And then I decided to add some stitching, using my sewing machine. I made three cards from scraps of fabric, including some leaf motifs from an old net curtain, having become rather taken with leaves by this point. These are fabric on fabric, plus one leaf skeleton, mounted on card. The one on the left incorporates lots of the tiny trimmings from all the other cards, thus using scraps from scraps. So, thank you Alys for the inspiration, I’m sure I’ll be making many more. If you fancy joining, contact Kate and she’ll add you to the list. It would be lovely to see more non-sewing posts, but any use of scraps is welcome. I can’t resist sharing this latest scrappy creation – a third twiddlemuff, this time made from a piece of abandoned crochet. Ages ago, my friend Danielle gave me a piece of crochet she’d been working on, but which had gone rather wonky along the edges. 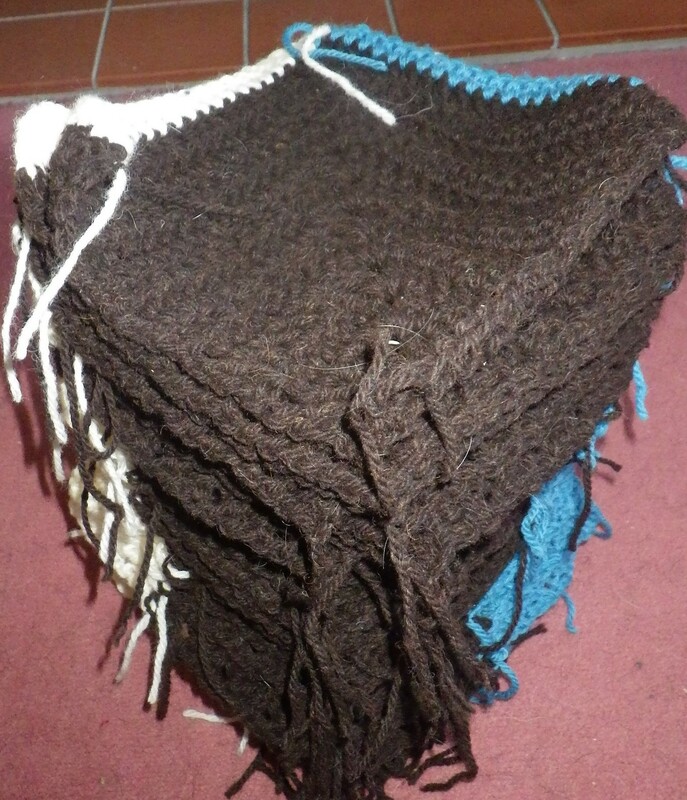 Originally, I was going to frog it and use the yarn for some charity knitting or crochet, but I was reluctant to pull it apart when the only issue was the edges. Having finished my last twiddlemuff, it dawned on me that this lovely bright, stripy creation would be an ideal outer and that all I needed to do was stitch it into a tube to hide the edges and then make an inner layer. That’s my last one for the time being, but I’m really pleased to have made use of some more “scrap”. It’s that time of year again when I’m busy sowing seeds and getting irrationally excited when the little green shoots appear from beneath the compost. Outdoors I have sown salad leaves, carrots and parsnips, although only the lettuces are showing signs of growth yet. As usual, my first sowing of leaves is in the old fish box retrieved from a local beach many years ago. Indoors, the peppers and chillies that I started sowing much earlier in the year and then sequentially until about a month ago are coming on well (all except one variety which has not germinated at all and must be duff seeds, since they have been kept under the same conditions as all the rest). The ones doing the best so far are the purple jalapeños which were amongst the first planted. This year we have an additional protected growing space. When Mr Snail moved into the flat he’d rented in Reading, it was full of stuff abandoned by previous tenants. After checking with the landlord, most of this went to a charity shop, but we retained one or two things, including a mini-greenhouse that had been on the tiny terrace. A few weeks back, Mr Snail put it together here in Wales and it’s providing a space for some sorrel frown last year as well as more germinating seeds: peas and various brassicas. Later in the summer, I think I shall put a couple of pepper plants in there to see how they get on. I certainly wouldn’t have gone out and bought a plastic greenhouse like this, but it seemed a shame not to make use of it and I think it could be a valuable addition, since my wooden cold frame rotted away some years ago. Inside the limery the carnivores are waking up and the citrus plants are growing great guns, and I’m dithering about exactly when to put them outside. My second twiddlemuff is complete. Again I used quite a lot of Scheepjes Softfun yarn, but I also included oddments of three pure cotton yarns (sunshine yellow, purple and an odd sort of pink/beige) and some cotton-rich bits that came, I think, originally from Jenny (Simply Hooked) a long, long time ago. Anyway, it’s nice and soft and easily washable and, yet again, I added some eyelash yarn so there was something fluffy to stroke and a pocket with a pompom on a string, plus a couple of crochet flowers, a crochet bobble that I found in my bag of scraps (I think it was originally a dragon nostril! ), another pompom with sparkly bits and two firmly tied pieces of cotton tape that had once fastened a box of French chocolates. I actually pulled out more buttons than this originally, but the suggestion is that there are only about five items on the inside and five items on the outside, so I whittled my selection down a bit. I really like this sort of scrappy project – it gives me the opportunity to work with bits and bobs that would otherwise probably remain languishing in a box or bag, plus it’s actually useful. I’m on a bit of a downer about how many scrap projects I see in various places that just convert one useless thing into a different useless, ugly thing…. and even worse, things that potentially spread problems further (plastic bag bunting, for example). I want to find ways to use scraps to make beautiful things, or useful things and that’s one of the reasons I’m always so inspired by the monthly ScrapHappy posts from everyone who joins in – long may you all continue to be so creative. Back in January one of my birthday presents from Mr Snail was a course at Make it in Wales – a café and craft space in Cardigan. Naturally there were no courses that I wanted to do near to my birthday, so it wasn’t until 10 days ago that I actually got my present. To make it even better, my friend Sue (Going Batty in Wales) also booked to come along, so we had a lovely day together being creative. The course I chose was Coptic bookbinding. I did do a little bit of bookbinding at primary school, but it’s a long, long time ago and I have no real recollection of it, apart from knowing that we made stitched books with a covered spine (no idea what the technical term is… is that case bound?). Coptic binding, in contrast, has exposed decorative stitching and the course involved making a keepsake book, with both pages and envelopes bound in. Because there is room for expansion, Coptic binding lends itself to a book that you might want to stick things in or with envelopes that might end up fatter than when originally inserted. The open spine shows off the pages inside, so using coloured paper around the bundles of white pages (the signatures) and for the envelopes allowed us to make attractive finished books. Our tutor, Carole King, provided hand-printed paper of her own design for the covers and keepsake envelopes, along with lovely plain colours to choose from. We started by making the covers for our books, pasting printed paper onto the boards and then adding a colour to cover the inside of each cover. I chose a black on white print of little houses and Sue chose a fishy design on green. After that we cut out three envelopes to go inside (one in the print and two coloured ones) added any extra colour we wanted and arranged our pages into a pleasing order. After a delicious lunch in the café (thank you Sue for treating me), the afternoon was spent learning to stitch our books together and finally finishing off by gluing the envelopes closed (you have to leave them open to allow access for stitching) and trimming the pages. It’s an ancient technique, but still being practiced and valued today. I’m pretty certain this won’t be the last book I make and I already have my eye on future courses to learn different techniques. Patricia’s post about knitting for good causes resulted in many suggestions (here on the blog and on Twitter and Facebook) of worthy recipients for our work. One, in particular, caught my eye because it was so local and covered two good causes: Incredible Edible Carmarthenshire (a group who promote community growing in public spaces) were asking for twiddlemuffs, apparently they keep a stock of them to hand out at events and they are running low. For those of you who are not familiar with twiddlemuffs, they are knitted or crocheted tubes, incorporating various textures and items that can be given to people with dementia so that they have something to occupy their restless hands, plus they can simply keep hands warm. I’ve made a few in the past, so I decided this would be a good way to use up some scraps and stash yarns. Periodically I acquire yarn that I probably wouldn’t actually go out and buy, and projects like the twiddlemuffs can be a great way to use some of this up. My Crochet Sanctuary weekend resulted in me coming home with some lovely blue Scheepjes Softfun yarn, intended to be used for a hot water bottle cover that we started during the retreat. However, on reflection I decided I didn’t really want another hot water bottle cover and so I frogged my work and put the yarn to one side. Rummaging through my stash, though, I came across it and knew that it would be an ideal base for a twiddlemuff – washable and soft. I started by crocheting a tube, with a few added stripes of yarn with different textures – a bobbly one, a couple of wooly ones, a bit of rough silk/cotton and some eyelash yarn, all left over from past projects. I added a little pocket, found a couple of crochet flowers that I made when I was teaching a workshop and stitched these on and made two pompoms – one for the inside and one attached by a crochet chain to take in and out of the pocket. To add some texture, I tied on a piece of cotton tape and a length of silky cord. 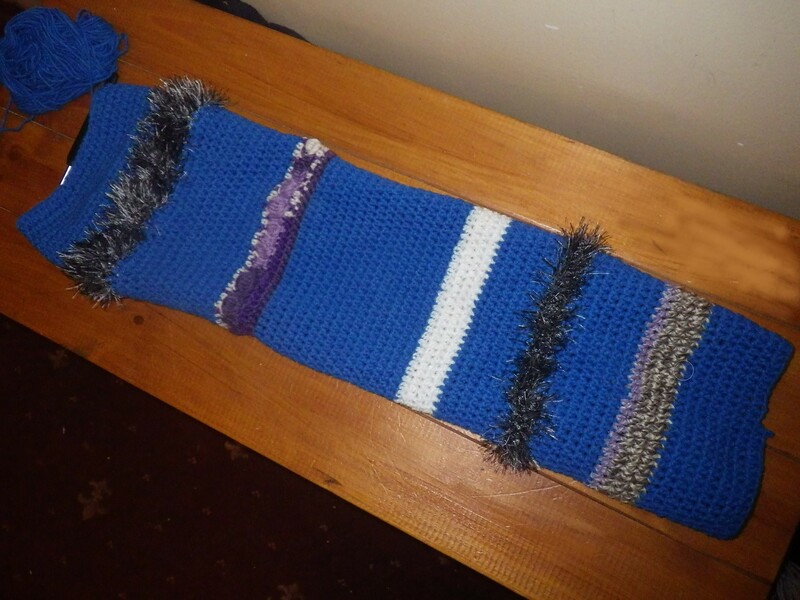 Finally I attached a few buttons – nothing too weighty, because twiddlemuffs shouldn’t be able to cause harm! I photographed it right way round and inside out so you could see what treasures lie hidden. The orange bits are on the inside. And… I remember the days before the internet. Do you? You know, when information was relatively difficult to find and we used to toddle off to the library to look things up. Now, I’m not saying that those were better days, and buying a knitting pattern certainly took much longer, but there were benefits. First, information in books tended, whilst biased by the author’s opinions/agenda, not to be enormously swayed by the demands of advertisers. And, second, some degree of filtering happened before a book was published – acceptance by a publisher and subsequent editing, for example. I know that there was still plenty of misinformation, not to mention downright lies, but we were exposed to less of it because all information (true or false) was harder to access. Now, we are bombarded by information and it can be overwhelming. How often do we look for something and get a million or more hits from our internet search, so only look at the first couple of suggested sites? How often do we see some figures on social media and think that they must be correct because they are quoted by a friend or a “trusted” source? Apart from anything else, what I consider to be a trustworthy source may not be the same as what you think is a trustworthy source. However, the fact that we can access all this vast store of information is marvellous because, unlike in days gone by, we can follow up on it, we can check it, we can examine sources, we can find out more about the view of the author or publisher and, therefore, we have the opportunity to be more discerning than ever before. But often, we don’t… because it takes time, or because the information that we see supports our existing view of the world or makes us feel good. I know that I am much more likely to fact-check something that I disagree with or that makes me uncomfortable than something that confirms my existing opinion. I am not someone who clicks the “share” button very often on my social media accounts and, you may have noticed, that here on the blog I try to research my information-sharing posts thoroughly and provide links to the sources. I generally don’t entirely believe the attention-grabbing headline statistics I see, but recently I find myself becoming more and more cynical and wondering what agenda is being served by the numbers and “facts” that appear before me. So, I’ve started looking a bit more closely – even at the numbers I like. I recently came across a useful fact checking charity called Full Fact, which seems to be impartial and I have used Snopes for many years. What I’d really like, though, is for people to check before they post. We are all responsible for “fake news” if we keep spreading it around. So… are you a sharer or a cynic? Do you have a preferred fact-checking website? Do you reference the information that you put on your blog? Yes, the first flowers on my monkey cup have finally opened and revealed themselves to be male. Only having one plant I knew I would never be able to have babies, but the flowers are interesting to see. I noticed this morning that one of the best places to see this plant from is in the shower, so I climbed back in the shower once it was dry and you can see how many lovely new leaves are appearing. It’s currently not forming new pitchers, but hopefully we’ll have lots more later in the year once the flower is done. Dorothy was 89 when I asked her how she spent the long dark evenings of winter. “Jigsaws’ was her answer. “Do you knit?” “I love knitting, but I’ve no one left to knit for”. Her family of children and grandchildren were grown up and fending for themselves and her great-grandchildren had reached the age when they would not be seen in hand made clothes. Now there’s a topic for discussion! Dot’s rather plaintive cry was something that I could relate to though in s slightly different way. I love making things, sewing in particular, but I’ve reached the stage where I have everything I need – sufficient clothes, accessories, curtains, aprons and the rest. From now on my sewing life could easily be confined to repairs and the making of an occasional pot holder. Any more would be surplus, excess. But I still love sewing and have a box of material just waiting to be used. How do we make stuff without making more stuff? Dot, at her knitting group, models a fleece hat! There was a simple solution for Dot. A few of us started to meet regularly in our village tea shop and exchange news about local projects needing hand knitted items. Now well into her 90s, Dot is keeping the local premature baby unit in exquisite tiny clothes. Others in the knitting group have produced hedgehogs for the local rescue, blankets for homeless people, warm bed socks to welcome refugees to the county. There was a solution for me too and a chance to get back to that stash of fabrics and enjoy my sewing again. Shoe bags for the women’s rescue, incubator quilts for the hospital, Little Dresses for Africa and my easy favourite Morsbags for the food bank. There are projects galore on the web wanting and needing our sewing skills. We can make more without making excess. Any favourite sites anyone? Somehow there has been much more doing than writing going on at Chez Snail in recent weeks Having completely failed to manage a scrappy project in time for the March ScrapHappy, I am determined now to do better in the coming month. I’ve been busy with some scrap-based things, but I’m saving posting about those so I don’t miss another SH on the 15th. I have completed the crochet for the sofa seat covers, but I’m dithering slightly about the finishing as I have a choice to make about the backing… I think I know what I’m going to do, but I don’t want to post about that until it’s complete. 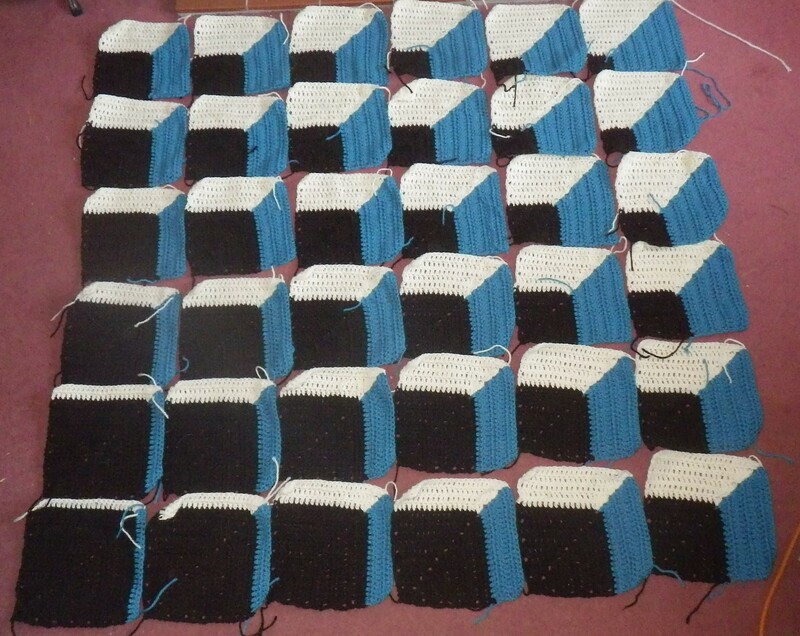 I rather like how different this design is from most crochet patterns – the simplicity and the optical illusion were very appealing to me, and it will look even better once the squares are joined and edged. The Pattern is Cubine by Magdalene Lee and you can find it on Ravelry. The wool is aran weight and all British: the brown is natural Zwartbles produced by my friend Val; the blue is from Woolyknit; and the cream is from New Lanark.